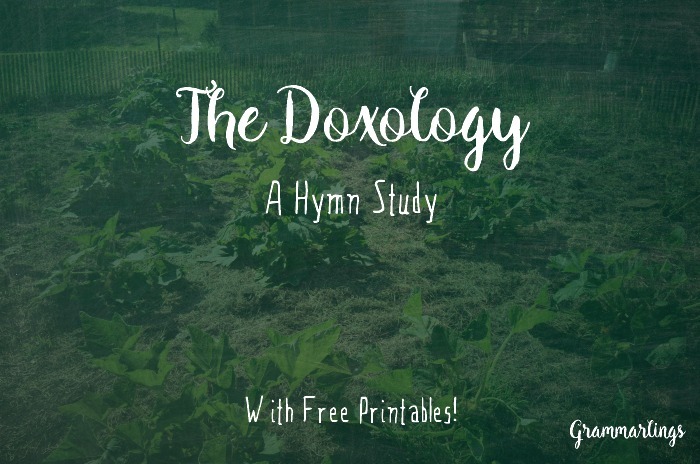 We've been doing a hymn study on the Doxology; I like to sing the Doxology when we are in the garden, and I wanted the kids to be able to join me. The Doxology is actually the last verse of a poem/hymn by Thomas Ken called "Awake, my soul, and with the Sun." And when I found this poem, I fell in love with it. In addition to singing the Doxology, I'm reading the whole poem in the mornings. It's a small way of getting our morning meetings started again. So many amazing thoughts! Like the line "Thy precious time misspent, redeem," speaks of wasted time, maybe on Facebook (for me) and watching TV (for the kids), or even just arguing instead of finding peace. And the other line we connected with is "For to my soul ’tis hell to be/But for one moment void of Thee." When we aren't thinking of God our Father, the peace of our home quickly dissipates and we're left with ill feelings and ugliness. I haven't decided if I want us to memorize the whole poem, although I am tempted. But for now, we're just reading, singing, and talking about the big thoughts. I'm also adding it to my personal Bible time. Some YouTube videos: a David Crowder version, a slow version with the words, and a pipe organ playing. Or a version of the full hymn here, but it's really hard to sing the last verse! The Proverbial Homemaker has a few printables for subscribers that look great. If you just want some copywork, I put together a couple of sheets for our house. Print copywork of the Doxology for Gideon, and cursive copywork of the entire poem for Eowyn. I haven't gone this far yet, but it's nice that it's available for later. 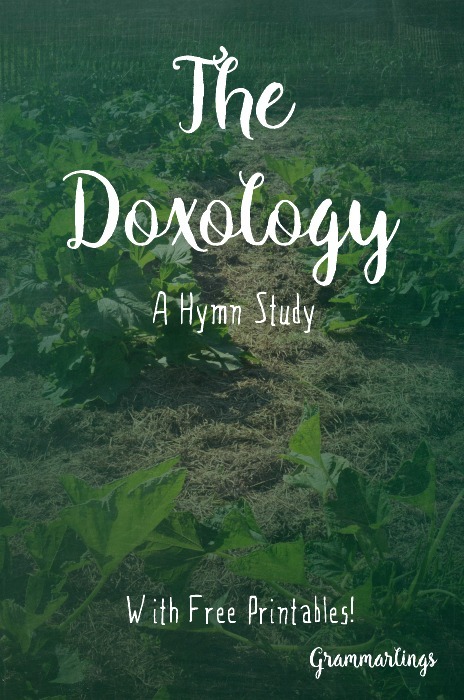 You could tie this study in with Greek and Latin by studying different doxologies, translating the Greek and Latin ones, and doing a word study of "Doxology. Here's a quick place to start! Have you read this poem? Which line speaks to you? I'm only familiar with the last stanza of that poem, it's really beautiful. We've recently added some hymn singing to our daily morning times and we love it! I'd really like to add more to it though and find some resources with the stories behind the hymns and the hymn writers. Copywork is a great idea! One of our favorites has been "It is Well" but prepare yourself if you haven't heard the story behind that one. You'll be weeping. There's a video of it one Youtube, my kids still ask to watch the whole video, it's so beautiful. Here it is: https://www.youtube.com/watch?v=7_42BImZXac Such an amazing story! So cool! I had no idea. thank you so much for sharing. I will be adding this to our list of poems to behold. It's a beauty, isn't it?! I just love it. Today, my wasted time has been just sitting here on the couch...doing absolutely nothing. I feel a little bad about it, but to my credit our spring and summer has been the busiest we've ever had and I just feel like doing nothing. blah...Great study though for homeschooling (Hymns) and it is a lovely lovely one. Thanks for sharing this Hymn Study....I learned some new verses, too :) So glad that you linked up at Together on Tuesdays!! My father is a retired Methodist pastor and you have no idea how many times we have sang this! Just reading through the verses brings back memories of Sunday church and listening to my dad preach! I am so blessed he is still with us and at 79 he is still preforming family weddings and such! thanks for the memories today! This made me smile, thank you for sharing your memories! Your Dad sounds awesome. Hi Jennifer, I left a comment last week but it must have disappeared into the blogosphere. Enjoyed your thoughts on the poem. We use the last verse to sing Grace before meals sometimes.